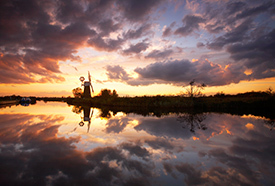 This Norfolk Broads photography course is a unique opportunity to photograph the iconic windmills of the Norfolk & Suffolk Broads. 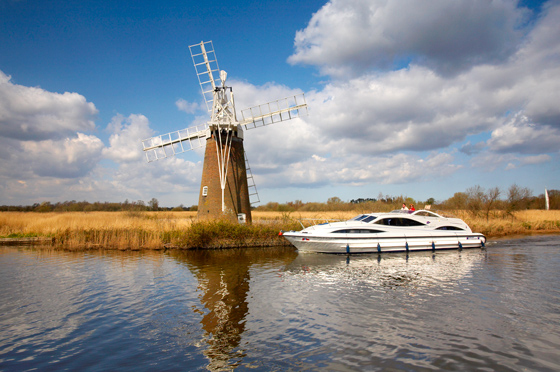 Our mode of transport throughout this outstanding course led by professional photographer Chris Herring is one of the broads largest cruisers, equipped with all the comforts of home including three toilets and fresh water showers on board. 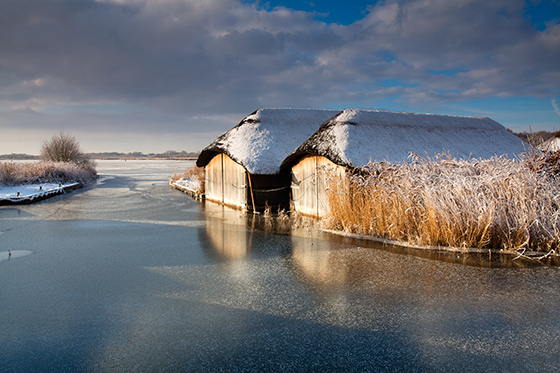 All accommodation is in private cabins. By using this unique leisurely mode transport we are able to navigate entire area at a pace which will maximise our photographic opportunities. 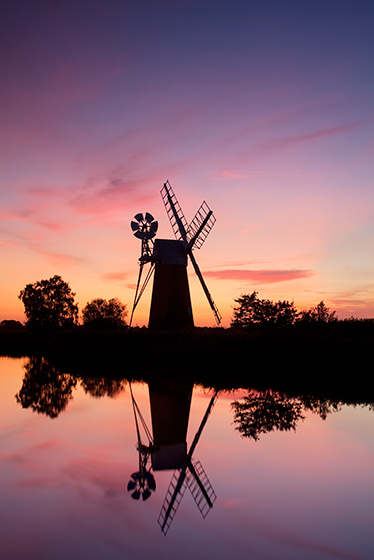 The landscape of the Norfolk is unique and like no other area in the UK, the area is a rich haven for wildlife and the wonderful drainage mills / windmills along with the broads themselves both make for excellent landscape opportunities. 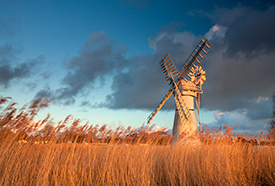 This workshop is a unique opportunity to photograph the iconic windmills of the Norfolk & Suffolk Broads. 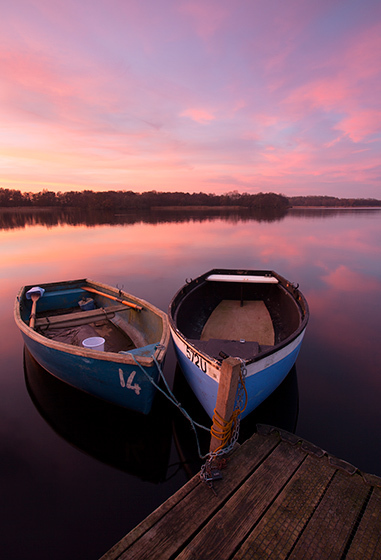 Our mode of transport and accommodation throughout this outstanding course led by professional photographer Chris Herring is one of the broads largest cruisers, equipped with all the comforts of home including three toilets and fresh water showers on board. By using this unique leisurely mode transport we are able to navigate entire area at a pace which will maximise our photographic opportunities. Our chosen boat for the workshops is one with the most spacious crafts on the Broads, with four double or twin cabins on board along with three fresh water showers and toilets, full kitchen area and dining table plus a TV, DVD player, microwave, heating and 240V power sockets suitable for charging camera batteries and laptops are also on board. The craft also has plenty of deck space allowing for plenty of photography from the boat on our trips along the river. By using a boat we can also navigate the entire area with only minimal walking required to get to our target areas. As we will also be using the river ways to travel between locations guests are then free to return back to bed following sunrise should they wish safe in the knowledge that they will not be left behind. 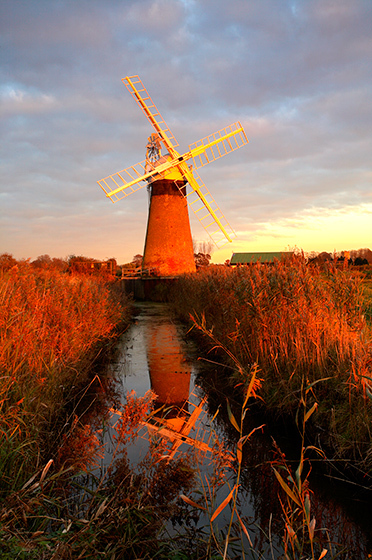 There are over 70 derelict mills in Norfolk and along with the restored mills we will photograph a selection of these mills on our journey. 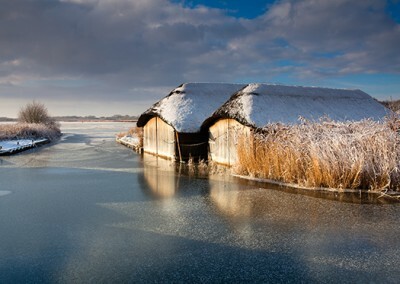 The workshops are aimed at photographers with an interest in landscape photography however due to the nature of our location there may also be a chance to shoot a range of wildlife subjects found in the area. As much of the wildlife is used to the boats that navigate the area close encounters with some of the Broads wonderful wildlife is always a possibility. 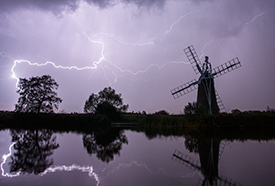 Target subjects include restored and derelict Drainage Mills / Windmills, Broadland traditional wherries and sailing boats along with a selection of the local wildlife. 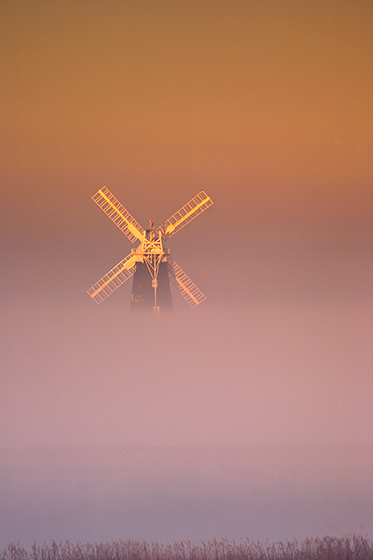 The workshops are aimed at photographers of all levels beginners and advanced alike. Breakfast & snacks are included in the price, lunchtime and evening meals including drinks are at guest’s own cost, a typical evening or lunchtime meal for our planned locations usually costs under £15 & will be at a number of local riverside pubs or restaurants for the various planned locations. Car Parking is included in the price at our base at Herbert Woods boat yard, all secure with a key coded barrier system. The workshops cater for all levels of experience, by ensuring that group numbers are kept to a maximum of just six participants ensures that there is lots of available time and tuition for individuals and the chance to be part of a small friendly group with other like minded photographers. As we will be staying in remote areas away from light pollution there will also be opportunities for participants to try some night and painting with light photography during the evenings should they wish.